Please note that, for security reasons, we will only ship to the verified address of the credit card and or the PayPal account holder for each transaction and is processed through our on line payment system. If you wish to change the shipping address a new transaction would have to be completed and the original transaction cancelled. Once your order has been approved it is sent to our warehouse for shipment. The product is shipped as soon as the order is processed and the inventory is available. For current product inventory and availability please call the store direct at 1-877-761-6354. If a product is out of stock in our warehouse, we may be unable to obtain a precise date of availability from the manufacturer. However, we try our best to confirm availability dates and communicate that to you as soon as possible. All new products sold through Gibbys Electronic Supermarket come with an original manufacturers warranties and are valid at all authorized service depots across Canada. If you cannot find a local service depot you can call Gibbys Electronic Supermarket toll free at 1-877-761-6354 and we can help you locate the closest authorized service depot to you. Gibbys Electronic Supermarket is an authorized dealer for all brands that it sells. Goods can be returned to Gibbys Electronic Supermarket (shipping charges are customers responsibility) to fulfill Canadian warranties or sent to an authorized manufacturers service depot in Canada with your original bill of sale. To find an authorized service depot you can call Gibbys at 1-877-761-6354 and we can help locate a service depot in your area. Gibbys Electronic Supermarket also offers “B Stock” products. They will be clearly marked in the description of the product when they are “B Stock”. All “B Stock” products come with warranties that vary (generally 1 year warranty) depending on the manufacturer. Otherwise all items sold by Gibbys Electronic Supermarket are brand new factory sealed items with full manufacturer’s warranties valid at any authorized manufacturers service depots across Canada. B- Stock can also be referred to as refurbished or re certified and are all re certified and tested by the manufacturer. We also offer “Open Box” items that come with original factory warranty, but sold for a lesser price than the equivalent new model. Any warranty repairs must be returned with a copy of the original bill of sale or sent to an authorized service depot in Canada. Warranty cards are not sufficient. You ship the product to us to facilitate the repair at your cost, we pay for shipping the repaired product back to you. Shipping charges are an estimate only during the checkout process. This is due to the extreme cost of shipping within Canada and the inability to accurately estimate on line every postal code, and every size of every item within Canada. Therefore we offer an estimate for shipping to most major cities within Canada (with the majority of postal code exceptions listed below). If the charges total more than the shipping estimate*, we will contact you to approve these additional shipping charges. The shipment of orders to certain remote locations, containing but not limited to postal codes starting with the following: (A0A-A9Z, B0A-B9Z, C0A-C9Z, E0A-E9Z, G0B-G0L, G0T-G0W, G3L-G4Z, J0M-J0M, J9E-J9E, J9K-J9Z, T0A-T0B, T0E-T1X, T6W-T7W, T8P-T8Z, T9G-T9Z, V0A-V0L, V0N-V1L, V1N-V2V, V3G-V3G, V8A-V8K, V9G-V9Z, X0A – X9Z, Y0A – Y9Z) may have additional costs associated with the shipments. What if I live in the Far North or a very isolated area? 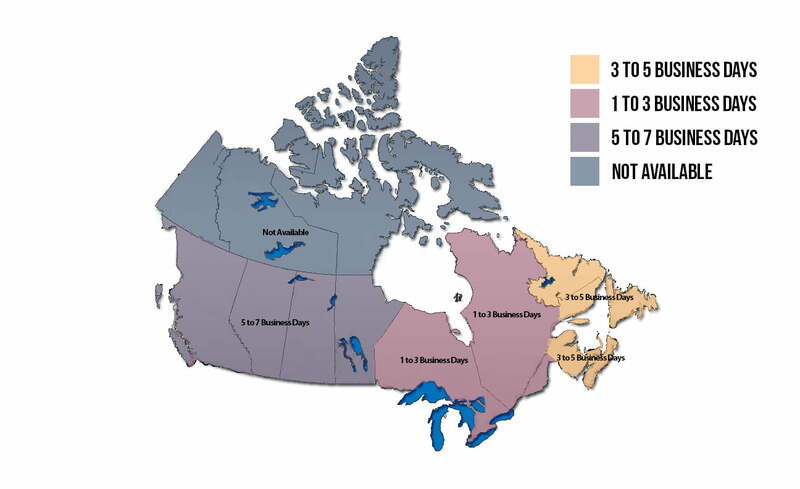 For some shipping addresses located in the three territories of Canada or in isolated rural areas, the actual shipping charge on larger items such as televisions, stands or large speakers may exceed those that are calculated at the time you place your order and indicated as shipping estimate*. Once we receive your order, we will get an exact quote for shipping and notify you of any extra charges prior to shipping your order if any. *Call Gibbys for full details of large sized products or products of 75 pounds or more at 1-877-761-6354 before ordering is preferred. You can call Gibbys during regular business hours to get an actual shipping cost on any item before you place the order on-line as well. In the case where free shipping is indicated, or shipping is indicated as $0.00, it means the shipping cost is covered by Gibbys and included in the price up to a maximum of 7% of the value of the product. If the actual shipping cost is more than 7 % of the value of the product we will get an exact quote for shipping and notify you of any extra charges prior to shipping your order. If you do not approve the additional cost we will cancel the order for you and release any amounts on hold on your credit card. Orders listed on line with or as “Free Shipping” will be charged for the original freight at whatever the cost of the freight incurred came out to. That amount will be a separate line on your invoice, but included in the total price where indicated with free shipping or shipping indicated as $0.00. We will accept your return as long as you pay for the return shipping or a restocking fee equal to the actual shipping costs incurred to ship the product to you. These fees are charged in order to keep item prices consistently low and are based on the actual cost of shipping. Please call us first so we can give you a Return Authorization Number (RAN). Returns without this pre authorization will take significantly longer or possible refusal of the returned item. Have you checked the troubleshooting tips provided in the owner’s manual? There are usually great suggestions from the manufacturer listed here that answer frequently asked questions. We recommend that you keep all the packing material for a minimum of 15 days in case a return or exchange are necessary and for the warranty term of the product in case shipping is necessary. Please call us first so we can give you a Return Authorization Number (RAN). Shipping and handling to return an item are the responsibility of the customer. We recommend using an insured and track able shipping method as we cannot be responsible for anything lost or damaged on its way back to us. Refunds will be issued in the same manner as the original form of payment (credit card, PayPal, etc.) other than cash, in which case a cheque will be issued and could take up to 3-4 days to process. Original shipping charges are non-refundable as well as shipping charges to return the product. Please note that additional fees may apply in the event of missing parts or accessories or a refusal of the return and refund. Gibbys will open inspect and test the item after it’s been received and can take 3-4 days to get checked before the refund is processed. (Any returned product will be opened and checked for accessories, damage, missing packaging and fully tested before a refund is issued). Final Sale Items – IMPORTANT: Products must be new and show no signs of use or installation or Gibbys Electronic Supermarket will refuse the return or charge a restocking fee. Bonus products, promotional bundles, free accessories, loyalty points, gift cards or other products that are not returned, but were included in a promotion with the product returned, will be deducted their full individually listed price from any credit or refund issued. Similarly, promotional products that are returned without their corresponding bundled product may not be credited. Any Television that is deemed to fall under the manufacturers “pinched panel” policy that is damaged from mishandling of the product. It is at the sole discretion of the manufacturer to refuse to replace or warranty any TV deemed to be a “pinched panel”. Call the store for full details before unpacking a television to review the “pinched panel” policy and procedure for unpacking ALL televisions. Handling instructions to avoid “pinched panel” issues are include with the shipment of the television and in the tracking number email received form Gibbys before your shipment arrives. Please take extreme care in handling of your televisions and review with anyone who might be unpacking or installing your TV for you. No returns will be accepted on any opened headphones or ear buds for sanitary reasons. Blown, punctured or fried speakers, sub-woofers and amplifiers. Once your RAN number is issued an email will be sent out to you containing your Return Mailing Label. The label is only valid for 5 days and is specifically coded by each shipment and is valid within Canada only. Gibbys Electronic Supermarket will accept returns of factory-sealed or open like-new merchandise within the terms of our policy. The original manufacturer’s packaging is required for an exchange or a refund. Refunds will be made in the same manner as the original form of payment (Credit Card, PayPal, Check, etc.). Please note that additional fees may apply or the exchange or refund might be refused in the event of missing parts or accessories, or original packaging. Refunds are valid and available for 15 days from the original purchase date. Exchanges are valid for 15 days from the original purchase. When you receive your package from us we recommend that you keep all packing material for at least 15 days in case you need to return or exchange it or for the length of the warranty in case of shipping. we’ll have our carrier contact you to schedule a return. If the package was obviously damaged at the time of delivery, please refuse the delivery and call us at 1-877-761-6354 right away before the driver leaves. we’ll gladly help troubleshoot and determine how to solve the problem. If we can’t fix it, we’ll arrange for service department to assess the television. If that department doesn’t resolve the issue, we’ll have our carrier contact you to schedule an exchange or return. Please call and review all purchases with our knowledgeable sales staff to avoid unnecessary returns or exchanges at 1-877-761-6354 prior to purchase. Make sure to include all factory-packaging and all original accessories in the original carton, with all UPC and bar codes intact (incomplete returns may be subject to additional fees and or refusal of exchange or refund). Please call us first at 1-877-761-6354 so we can give you a Return Authorization Number (RAN). Packages returned without an RAN number will be refused. Your RAN number is valid for 5 days. Shipping and handling (S&H) and duties if applicable to return an item are the responsibility of the customer and the deduction will be the equivalent to standard shipping costs for that item. Make sure to include all factory-packed accessories in the original carton, with all UPC and bar codes intact (incomplete returns may be subject to additional fees). Return Merchandise must be double-boxed, or with protective packaging if it was originally shipped that way, with no writing on the manufacturer’s box. Please call us at 1-877-761-6354 if you have questions. IMPORTANT: In order for us to process any refund, return or exchange we will require your original Gibbys Electronic Supermarket receipt. Please note that unless you have purchased a refurbished (B-Stock) product, or (OPEN BOX) product (which will be clearly specified at the time of your purchase and on your invoice), Gibbys Electronic Supermarket only ships brand new, factory sealed products from our store. This is done to eliminate any possibility of miscommunication when a product is being returned for refund or exchange. For items returned to either a retail store or mailed in, we will verify that the product meets the criteria listed above with regard to original condition and packaging. Once we have verified this and verified the serial numbers, we will be happy to process your refund or exchange (shipping or delivery charges are non-refundable). You can expect your refund to be processed within 5 to 7 days of us receiving the product. As easy as we try to make it, we realize that returning merchandise is no fun. So if you have any doubts or concerns about your purchase, our knowledgeable staff have all the information you need to feel comfortable with your order before you place it. Please call us at 1-877-761-6354 with any questions about the item(s) you intend to purchase. Gibbys strives to ensure that the contents are accurate and reliable. However, Gibbys and its agents are not infallible, and errors and/or omissions may sometimes occur. Therefore, Gibbys disclaims any warranty of any kind, whether express or implied, as to any matter whatsoever relating to this web site and any links thereto and there from, including, without limitation, as to the merchantability, non-infringement of intellectual property, or fitness for any particular purpose. Gibbys does not warrant the accuracy, currency or completeness of the contents, including, without limitation, any information relating to prices or availability. For current inventory and availability please call the store direct at 1-877-761-6354. Gibbys will from time to time revise the contents and/or the products, services described therein and reserves the right to make such changes without any obligation to notify past, current or prospective visitors of this website. Gibbys reserves the right to limit quantities available for sale or sold, and the right at any time to reject, cancel or terminate any order for any reason. If the price of any product was incorrectly displayed on our website, we will provide you with an opportunity to place an order at the correct price.